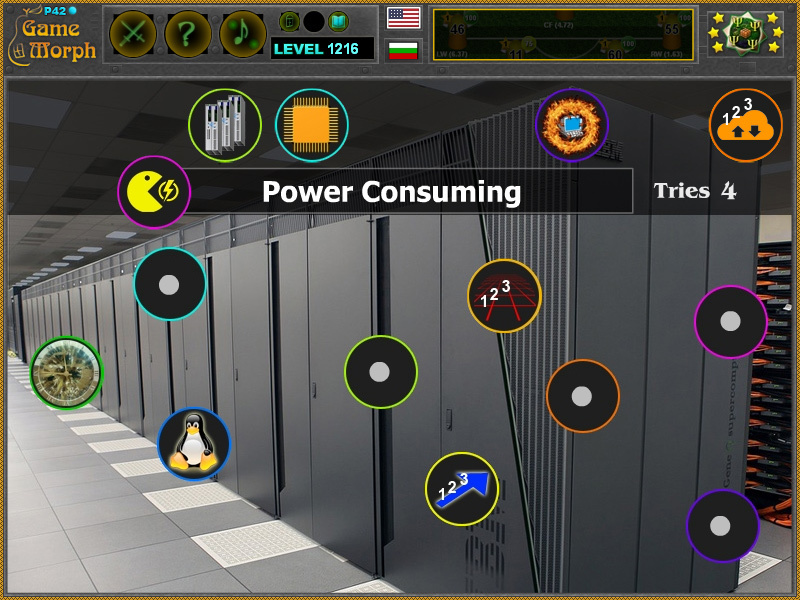 "Supercomputer Properties" is a free online knowledge level game to study the statistics of supercomputers. Minute to win it game. Computer Technology Class for desktop computers, laptops and tablets, which may be played in the web browser. Sort the properties of the supercomputers by color. Computers learning game, suitable for online classes and interactive lessons. Free online educational game. Lesson 1a for 9 grade clasroom game. How to play Supercomputer Properties. There are 9 pictures at the top of the screen, representing different statistics of the supercomputer. Drag and drop them in the socked with the same color. Sort all 9 properties to win the game. Know 3 statistics of a supercomputer are used for and get +1 Knowledge Level. From Wikipedia: Performance of a supercomputer is measured in floating-point operations per second (FLOPS) instead of million instructions per second (MIPS). As of 2017, there are supercomputers which can perform up to nearly a hundred quadrillion FLOPS. As of November 2017, all of the world's fastest 500 supercomputers run Linux-based operating systems. Additional research is being conducted in China, the United States, the European Union, Taiwan and Japan to build even faster, more powerful and more technologically superior exascale supercomputers. The only computer to seriously challenge the Cray-1's performance in the 1970s was the ILLIAC IV. This machine was the first realized example of a true massively parallel computer, in which many processors worked together to solve different parts of a single larger problem. In contrast with the vector systems, which were designed to run a single stream of data as quickly as possible, in this concept, the computer instead feeds separate parts of the data to entirely different processors and then recombines the results. Throughout the decades, the management of heat density has remained a key issue for most centralized supercomputers. The large amount of heat generated by a system may also have other effects, e.g. reducing the lifetime of other system components. There have been diverse approaches to heat management, from pumping Fluorinert through the system, to a hybrid liquid-air cooling system or air cooling with normal air conditioning temperatures. This fun classroom game is an exciting occupation for the Supercomputers lesson.